Eldritch Moon Spoiler: Ulvenwald Captive! Just a short month ago, Eternal Masters was released, including many valuable reprints, first-time foils, new artwork, complex and enjoyable limited format, and a pile of rarity-shifted cards for Pauper players. Peregrine Drake is already sinking its claws into combo decks, while other cards like Avarax, Elvish Vanguard, and Rally the Peasants have been featured in 5-0 league decks. Two weeks into its Magic Online life, and Eternal Masters has already made a lasting impact on the format. So, let’s take a look at what this card has to offer. First, this creature is a Werewolf that does not have the classic Werewolf ability. Unfortunately, that means it does not transform with the only Werewolf-matters common, Moonmist, though it does get to ignore the Fog effect. Most of the other Werewolves at common are fairly aggressive, so maybe this defender version does not fit with its Werewolf cousins. Second, this card actually has a unique set of stats: it’s the first ever creature in Magic that costs 1G for a 1/2 with defender. Those are not very impressive stats, of course, but two toughness does dodge Pauper’s one-damage effects like Cuombajj Witches and Electrickery. It also makes mana, but most of the other 1G mana-producers are not seeing play in Pauper: it takes a high power level to break into an eternal format, and Priest of Titania is significantly more powerful than a ½ defender. This might be something we can work with. For starters, four power and six toughness lines up well in Pauper. It dodges every Red removal spell, kills most of the creatures in one-on-one combat, and even blocks the big threats of Gurmag Angler and Fangren Marauder. It has to survive being a 1/2 for a while, but making it through that turns it into a sizable creature. It also taps to add CC to your mana pool. Its colorlessness may not be relevant for paying costs in Pauper, but the mana bump could help cast other large creatures, or transform other Ulvenwald Captives. Also, let’s just take a minute to appreciate that type line: Creature – Eldrazi Werewolf. Who would have thought we would ever see that printed on the card? So, we’ve seen both sides of the card, and weighed the merits of both. The question remains: what kind of deck would want this kind of card? My gut instinct says that this card would be best in a ramp deck with a creature focus, as opposed to the usual Tron lists that focus on lands for ramping. Often, the biggest problem with such a deck is that if you draw too many mana creatures, your deck does nothing, and if you draw to many threats, you can’t cast them. Ulvenwald Captive, however, is both a mana creature and a threat. It may not be the best option for either category on its own, but fitting both could make it a potential threat. This is the roughest of rough drafts, but it conveys the idea behind the strategy: spend the first few turns playing out ramping creatures, then land giant threats. Ulvenwald Captive in particular works as a role-player and a threat once the opponent has blown through their removal one the actual threats. Plus, with Pauper’s abundance of removal, many of your creatures are likely to die, and Werebear and Nimble Mongoose benefit from the stocked graveyard. 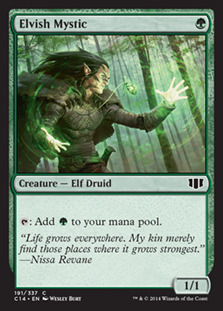 Ulvenwald Captive may not be the most impactful new card, but it’s certainly a cool one. I can definitely see it being solid in Limited, particularly Sealed, and perhaps could find a home in Standard Pauper. I’m excited to see what the rest of the set has in store! What do you think of Ulvenwald Captive? Any decks come to mind that would love a creature like it? What else in Eldritch Moon looks enticing to you? Congrats on getting a spoiler card :D 6 to transform seems very expensive but mana producers are scarce in Standard at the moment and the G may be more relevant than the 4/6 sol ring. And eventually you will get to 6 mana and if you still need the Sol Ring effect here it is hidden behind an innocuous werewolf horror.